The Player's Guide to Robert E Howard's Conan: Adventures in an Age Undreamed Of takes you into the world of Conan the Barbarian, a place where astonishing heroes battle loathsome monsters, raise swords against dire sorcery, and travel to exotic and unknown lands! Within these covers you'll find all the information you need to create a wide range of characters, whether heroic barbarians, bold rogues, seasoned mercenaries, wise priests, stealthy archers, hardy nomads, or more! Create your own legend in the time before history! Everything you need to create characters from across the whole of Conan's world, including skills, talents, and more. Discover if you've descended from an ancient line that survived the Cataclysm! Choose or roll to create the character you want, picking options such as homeland, attributes, archetype, caste, family history, nature, education, and more. Select your starting gear from a wide range of equipment, whether a sturdy broadsword a Bossonian bow, horned helmet and scale-mail hauberk... or a sorcerous circle of power. All the 2d20 core rules you need to play, including task resolution, features like Momentum and Fortune, struggles, combat, and more. 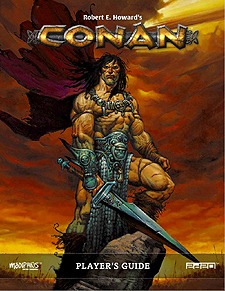 Art by a team of iconic Conan artists, including Tim Truman, Simon Bisley, Esteban Maroto, Paolo Parente, Phroilan Gardner, Mark Schultz, Tomas Giorello, and more. This book requires the Robert E Howard's Conan: Adventures in an Age Undreamed Of to use.